Vladimir Putin and British Prime Minister David Cameron talked over the phone about the Syrian crisis and both the leaders agreed that a political solution is necessary. Perhaps it will be counted as one of the most imprudent acts on part of international players not to develop a common position on Syria, where common people are dying every day. The Syrian crisis will remain one of the failures of 21st century international politics. While leaders across the world agree that Syria is entering into a period of chaos and turning into an enclave of extremism, the inaction to defuse the crisis is really startling. Despite common declaration that peace should prevail in Syria, despite common agreement that Syria is gradually becoming a hotbed of terrorism, it is allowed slide into the pit of chaos and instability. The ground reality, however, is worsening day by day. More than 70,000 people have lost their lives so far. The extremists did not hesitate to kill the octogenarian Sunni cleric of Syria, Mohamed Saeed al-Bouti while he was giving a sermon at the historic mosque in Damascus. 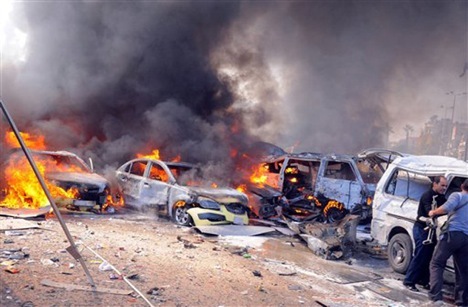 The suicide attack on March 22 besides killing the mufti also killed 49 civilians who were attending the sermon. The situation is getting precarious with the reports suggesting that the rebels might have seized portions of chemical weapons. Syria is host to many markers of Islamic civilization with historical cities like Damascus and Aleppo. These cities are gradually turning into debris with intense fighting between the forces of Assad and the rebels. Considered to be a moderate Muslim state, Syria is now in utter chaos. Its economy has been completely paralyzed, with people of the country becoming refugees and internally displaced. All these devastations are taking place in public glare. The United Nations failed to broker peace as the powerful nations failed to achieve a consensus. The rebel groups have become Frankenstein’s Monster. Initially hailed in some quarters as liberators of the people from the autocratic regime of Assad, now the rebels are perceived to be obstacles in the peace-building process. The supporters of rebels have grown restless as the war has entered into third year. Some nations prefer to adopt a hasty solution: provide more weapons to rebels so that the Assad regime can fall soon. These powers fail to learn from the Libyan episode where the arms supplied to fight Gaddafi fell into the hands of Al Qaeda and its affiliates. Why then, despite seemingly agreeing that extremism thrives in Syria, is there no common agreement to address the crisis? Why despite the common agreement between divergent powers like Russia and the UK that there should be a political solution is there no coordination between these powers? Why have the efforts of the UN and Arab League mediator Lakhdar Brahimi, who worked hard for a dialogue among the parties, failed? Recently, Brahimi lamented that “Syria is melting away.” Efforts of the Russian Foreign Minister Sergei Lavrov and his meetings with diplomats from other United Nations Security Council members so far have not worked out. There are primarily two reasons for this stalemate in Syria. The major players failed to develop a common front. The lack of consensus may turn the region of greater Middle East into a powder keg of sectarianism. They prefer to support countries with sheer calculations of real or perceived national interests, without taking into account that the menace of Al Qaeda and sectarianism can spread like a forest fire if no genuine stability and peace is established after the war ends, if at all in foreseeable future. The fall of chemical weapons into the hands of extremists will really have dangerous consequences. Already sectarian clashes are taking place in Iraq; it does not need a genius to predict that any extremist regime will engulf the whole region in wider scales of violence and destruction. The killing of al-Bouti brings to focus that the rebels would not tolerate any opposition to their goal, even if it is non-violent. Bouti was not a leader of any armed group, or a preacher of violence. He was one the respected clerics in Syria. His fault was that he supported the Assad regime. By this standard of the rebels, all supporters of Assad regime need to be eliminated. This intolerance, religious extremism, and insistence on violence will have far reaching negative consequences. Rebels are against the dialogue process. In the absence of any opposition to their activities, the turn of Syria into an enclave of extremism is almost a foregone conclusion. It will be enormously difficult for Syria to return to normalcy even if Assad is ousted from power peacefully or violently. His removal from power through a peaceful dialogue under an international supervision will at least put a check on rebel activities and help foster the return of normalcy in the war torn country. Any violent removal, which does not appear in sight at present, will draw Syria in to an unending pit of chaos, instability, sectarianism and religious extremism. In addition to being an enclave of extremism, it will be a centre of global extremism and terrorism. Dr Debidatta Aurobinda Mahapatra is an Indian commentator. His areas of interests include India-Russia relations, conflict and peace, and strategic aspects of Eurasian politics.